If you’ve been in one of my workshops where I talk about writing fiction, I usually hand out small cards with these words on them: character, setting, plot, theme. For me, they are the four corners of all good fiction. But when you begin a story, you usually have only of these things: a character you find interesting for whatever reason (might be completely made-up, based on someone you know, or a combo); a setting (again, either completely imaginary, very real, or a combination); a plot, or at least the beginning of a plot, even if only a “What if?”; or a theme (a message you want to present in some fashion to your reader). 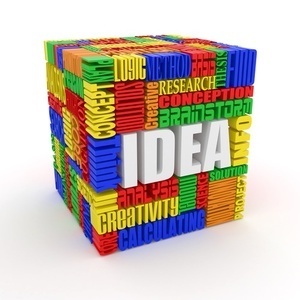 There’s no rule about which kind of idea you should have first. A story or a book can come from any of these places.The trick is to start with your beginning idea and build from there, adding the other foundation blocks. 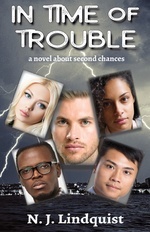 My novel, In Time of Trouble, started with a character. The boy who was the model for the character, Shane, was in a high school class I taught years ago. He was tall, athletic, blond, and as communicative as a brick wall. But there was something in him I had to reach, and eventually we did have a breakthrough. Don’t get me wrong. He isn’t Shane—there are many differences between them—but without him, I doubt very much that I would ever have conceived the character of Shane. Later, as the story began to develop and I had to make choices as to what Shane did and said, he became very real to me, and I began to see what would happen (the plot), based on his personality and his strengths and weaknesses. I knew Shane was going to accept Christ half-way through the book, and I knew that in the end he and Scott would, if not reconcile, at least find a meeting-point. By the way, the entire episode, which takes place near the end, with Scott dating Paige (who Shane was dating), actually began as a short story that I wrote long before I wrote the book. I simply incorporated the story into the book. As for the message, I realized in a drama class at a Write! Canada (then God Uses Ink) conference, after I had written the book, that in a sense it’s a different take on the prodigal son story. God gives second chances. The title came from Proverbs 17:17 a few days before it went to print—up until then it had been called Two of A Kind. However, a TV show with that name had come out and I realized I needed to change it. I like the second title better. I actually called the book A Setting for Murder up until a little while before it was published. 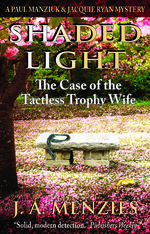 Since I wanted to write a classic style mystery, I placed the garden in a closed estate in the Toronto area. Then I began to develop the characters, beginning with the type of person who would become the body. I decided the estate would be owned by a corporate lawyer whose wife Ellen was uncomfortable with their new lifestyle. And they would have an only son who Ellen wanted to match up with her favourite cousin’s daughter. That led to the young lady, Lorry, visiting from Alberta. From there, the rest of the characters just appeared: the son’s lady-killer roommate; the other lawyers in the firm and their wives; the black sheep nephew, the housekeeper and her daughter, and so on. Put all those characters together for a few days and things happen. My plot simply fell into place because of who the characters were and their interactions with each other. Oh yeah, the gist of the comment was that someone needed to take a certain hockey player outside and knock some sense into his head. Now, I’m a total sports fan, and I’d been thinking for some time that I’d love to set a book in the world of sports. When I heard this comment, the plot literally leaped into my mind. 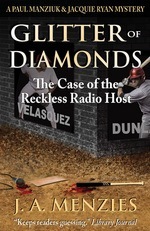 What if a sports announcer suggested taking a bat to the head of an annoying baseball player? And what if someone actually did? Would the announcer be responsible? When I got home, I had a huge amount of fun creating characters to fit the plot: a couple of talk show hosts, a long-suffering producer, a baseball team, including a very annoying but gifted Cuban pitcher and a struggling, older pitcher, a couple of newspaper reporters, a rather odd team owner, a jilted wife, a Marilyn Monroe clone, and a James Bond style mystery man. Put those characters together and, naturally, the story just flowed. It was probably the book I’ve had the most fun writing. The theme? It began with “All that glisters (glitters?) is not gold” from The Merchant of Venice, one of my absolute favourite plays. And ended there. 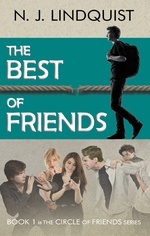 My novel The Best of Friends came about because I had something I really wanted to say to kids. So many of the kids I’d taught in school or worked with in youth groups had their priorities a bit mixed up, in my opinion. So I set out to write a book that showed that what’s inside—in one’s heart—is far more important than outward appearance, material possessions, or popularity. I created three teenage boys: Glen, who is Mr. Average Teenager in every way; Charlie, the doctor’s son, who is the new kid in town and who is handsome, smart, athletic, and well-off; and Luke, who was top dog before Charlie arrived, but who has more of the rebel vibe. And then I created three girls: Nicole, who is smart, sweet, and gorgeous; her friend, Zoey, who is quiet and kind of average; and Marta, attractive but with a personality like nails on a chalkboard. And I put them in a small town like the one I grew up in. As is the case with most teenagers, lots of things, both good and bad, happened quite naturally. And then I wrote three more books with the same characters. After four books, I think the series gives my beginning message, but I also think the books says a lot more, and I would suggest that each person might see something different. As the writer, I may have one message in mind, but as a reader, what you see may be quite different from what I intended. That comes in part from our being different people with different experiences and needs, and partly from my skill in helping you see what I want you to see. So can you start with a message? Sure, why not? The trick is that you don’t force a message where it isn’t needed, or tack on a message that doesn’t fit, or get so determined to put in the message that you ignore the characters and the plot and the setting. No matter where your first idea comes from, there have to be strong characters who drive the story; a setting the reader can visualize, and which affects the story, and a compelling story. If you do that, the message, if there is one, will come out on its own, and might well be different for different readers. Check the Category Lists at the top of the home page for more posts on this or similar topics.